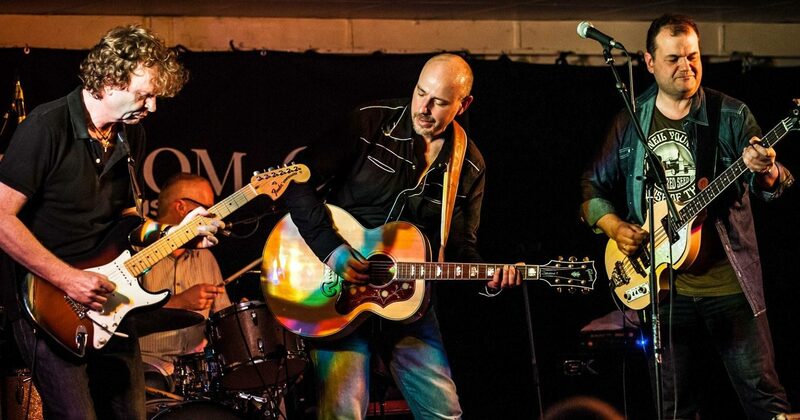 It was an exhilarating night when the Steve Eggs Band unleashed a storm of cheers and whistles from the audience at one of London’s best ‘live’ music venues. And what was the cause of all the excitement? A band playing its own highly original songs with panache and conviction and having a great time in the process. 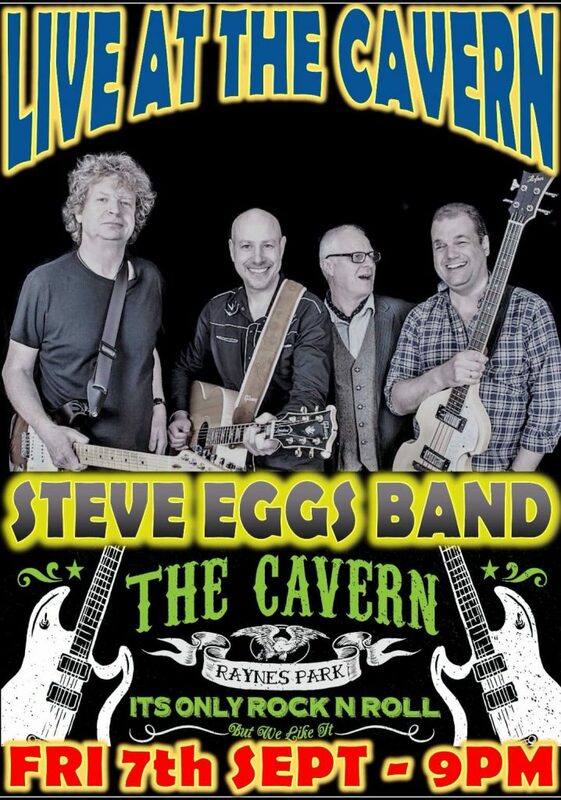 And that’s just what happened at a crowded Cavern Club in Raynes Park, London when the Egg Men rode into town (September 7th 2018). An encouraging moment for any group comes when the promoter steps up to the stage after the sound check, smiles his approval and offers drinks all round. From then on it’s just a matter enjoying the rest of the evening and playing with hyper enthusiasm. So it was good news when Noel Nevin, the Cavern’s ebullient chief of operations, gave a thumbs up before the show had even started. The SEBs have amassed a treasure trove of songs over recent years, many of them featured on Glove, Home Town Skyline and on their Live At The Boom Boom Club albums. And still they keep coming, like Faraway the lilting, relaxed opener with Mark Taylor, their stick twirling drummer, playing swinging brushes. It’s an understanding of dynamics and the ability to launch audiences on a voyage of discovery that sets this band apart. No need to blast at maximum volume from the get-go. Once hooked there follows a quickening pace and subtle uplift in power, displayed on The Road To California from their debut album, with a hook line that spins around in your ears for days. Steve Eggs joyfully sang his way into the next tune Falling Into You from Home Town Skyline. It was a fast country rocker that propelled lead guitarist Jonathan Kershaw into the first of many powerful solos, as the song segued neatly into Johnny Cash’s Folsom Prison Blues. Jon’s bottle neck solo and sparring duel with Steve’s acoustic guitar raised the temperature to the point where couples began dancing in front of the stage and strong men were in danger of spilling their beer. Eat yer heart out Albert Lee, that’s all ahm a sayin’. I Believe In Love was made all the more atmospheric with skilful use of Jon’s trusty wah wah pedal. The stomping, riff laden Paradise was followed by an amazing new compositions from Steve, whose working title is Nobody Makes It On Their Own, and is soon to be heard on their next album. “I’ll introduce you to the horn section now,” said Mr. Eggs, ready to blow some harmonica on his latest love song Darling, on which he also played his trusty acoustic guitar. The ballad was set in motion by a grandiose drum introduction worthy of Ringo Starr on a night out with John Bonham. Peter Wass, Hofner bass player supreme, then unveiled his own composition Here Comes The Rain, accompanied by his old mate Steve on vocals and copious jokes about Raynes Park, an area prone to heavy rainfall it seems. Ghost Train is another remarkably atmospheric and irresistibly catchy tune also destined for the album release. (Expect it to be adorned with the kind of spooky studio effects not easily obtained ‘live’ at the Cavern). But there was more! Good Intentions another of those Eggsian songs that should be headed to Number One with a bullet in the U.S. Billboard Chart, kicked the last set of the night with the entire band singing the chorus betwixt and between more fiery guitar. ‘Here is a new song that will be on our new CD, a lively country rocker,’ explained Steve, launching into Don’t Kick My Heart Around while It’s No Good was apparently ‘All about stalking. Nothing wrong with a bit of stalking on a Saturday night’ he proclaimed amidst much laughter from the Cavernites. Jon’s echoing guitar a la Link Wray would be an ideal soundtrack for a Western movie and Mark’s drums also galloped along with an appropriately pounding beat. As the band heated up so did Jon’s Fender. Always careful never to over- blow and ever ready to complement the song, when finally set loose on a solo, his playing is inspirational. Or should I say sensational. His high speed solo on The Apartment Song displayed a flying finger technique that would surely blow away most heavy metal heroes.